My favorite cigar has turned into my everyday smoke and my only smoke. Best of the best ! 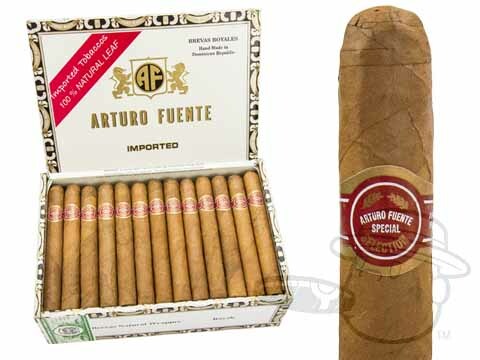 Consistent, smooth, everyday smoke from Arturo Feunte. Quality cigar at reasonable price. I have been smoking these for years now and it is the best everyday smoke as it is consistent in flavor, draw and construction. This cigar is my favorite for everyday smoking. Along with the price is the flavor, draw/burn and the construction. I have been smoking these for years and will not change ! Consistent every day medium bodied cigar! Very pleased with this everyday cigar from Best Cigars. For consistency in Appearance and Flavor you can't beat Brevas Royalas Natural. My choice for many years now and I don't plan on changing. I have been using BestCigarPrices for 13 years to buy my cigars with very good service. This is a well made cigar burns evenly and is very good. First time buy but not my last. Great everyday smoke, not to mild not to strong, just right, always fresh from best cigars! If you love a great tasting, long lasting cigar. Try these! Hands down the best prices and the best place to purchase! Arturo Fuente Brevas Royales Natural is rated 4.3 out of 5 based on 22 customer ratings.